The Lake Superior Steelhead Association (LSSA) received a grant from the Lessard/Sams Outdoor Heritage Fund to rehabilitate trout habitat in the West Branch of the Knife River. This grant consisted of three phases. Phase I: assessing, designing and rehabilitating trout habitat; Phase II: locating black ash stands; Phase III: improving steelhead passage. Phase I included conducting an aerial survey, stream walk-through, water temperature monitoring, aquatic invertebrate collection and electro-fish sampling to obtain baseline stream data. This assessment identified impaired stream sections, spring water seepages and stream rehabilitation sites. Phase II examined color infrared photography to identify black ash tree stands. Color infrared photography differentiated black ash from other tree stands due to their lack of autumn foliage. Field confirmation was conducted in the spring for quality control. Phase III consisted of restoring the second falls. The DNR altered the second falls by installing a weir in the 1970s to facilitate fish passage. In ~2003 the weir was lost during a weather event. This project restored the fish passageway by placing large boulders in the proximity of the former weir to create an improved jumping pool. These boulders mimicked the look of the original falls. Amity Creek is one of ~720 perennial trout streams flowing into Lake Superior. Bedrock escarpments create steep, forested corridors with thin, erodible soils, low productivity, and “flashy” hydrology. Amity’s watershed is mostly undeveloped (~4% rural/urban), but faces increasing development and climate change related impacts from increased temperature, stormwater runoff, erosion, riparian canopy opening, impervious surface, road crossings and reduced base flow. The stream was listed as Impaired in 2004 from excess turbidity from suspended sediment. A private gift spawned the Weber Stream Restoration Initiative (www.lakesuperiorstreams.org/weber) to help restore and protect Northshore streams using Amity as a demonstration project for restoration, assessment, and outreach activities. Partnership projects since 2005 include: two stream bank/channel stabilizations; a neighborhood stormwater reduction experiment; water, habitat, and biological monitoring; outreach activities, and developing GIS landscape stressor maps highlighting areas of higher environmental risk. GLRI funded efforts since 2011 include: (1) installing BMPs in critical areas; (2) development of on-line mapping tools for rural landowners to reduce erosion and stormwater runoff ; (3) a regional ditch design/maintenance manual; (4) geomorphic assessment of banks/bluffs using aerial and ground-based Lidar scanning; (5) assessing potential for increased groundwater storage; (6) WQ, habitat, and biological assessment; and (7) web-based outreach/education. Habitat improvement projects employ various techniques to corral flow, create hydrologic complexity, or improve specific types of stream habitat. We are monitoring the effectiveness of a habitat improvement project on the Sucker River in NE Minnesota with the goal of improving deep pool habitat through a combination of installed large woody debris (LWD) jams and cross-vanes. We established a monitoring framework being implemented by University of Minnesota Duluth students through class laboratory assignments. To date, we have conducted pre- and post-installation surveys on 16 transects, plus LWD and pool surveys throughout the entire reach. Initial results indicated that pool habitat (areas > 60 cm deep) in the 400 meter reach increased from 53 m2 pre-installation, with 40% of that area in the largest pool, to 123 m2 immediately post-installation, with 18% in the largest pool. Additional surveys in July and October 2011 indicated a continued increase in deep pool area, from 208 m2 to 347 m2; and wood quantities increased with additional installed and captured debris. During a 500-year flood event in June 2012, many pools were filled in, leading to only 94 m2 of remaining deep pool area. While LWD quantity stayed the same, many installed structures were destroyed. Abstract. Hydrology is increasingly recognized as a primary determinant of aquatic, riparian and shoreland ecological structure and function. Surface and groundwater use, landscape modification, and climate change can all modify basin hydrology and streamflow regimes, but the quantitative connections between these changes and ecological conditions are often poorly understood. This poster will summarize a 2010-2011 initiative led by The Nature Conservancy to advance understanding of ecological flow needs in Minnesota and establish ecological criteria for assessing and preventing flow alteration in aquatic systems based on the Ecological Limits of Hydrologic Alteration (ELOHA) framework (Poff et al, 2009). ELOHA is a rapid, flexible, framework for determining water requirements for healthy, sustainable rivers and integrating those requirements into regional water management. The Conservancy’s effort in Minnesota focused on a) assessing available data, criteria, tools and approaches to development of ecological flow criteria (both science and policy), b) developing consensus on technical approaches to characterizing flow metrics and ecological response, c) and assessing ecological flow response relationships for Minnesota’s Great Lakes Basin streams as a pilot to identify and develop flow metrics and criteria needed to protect aquatic systems statewide. Currently, a number of state, regional and university research initiatives are continuing to address gaps in the scientific foundation, policy applications, and/or implementation that were identified in this process. These efforts hold promise for progress on ecological flow protection and sustainable water management in Minnesota. Fish Vis Mapper presents possible changes in fish species occurrence in response to global climate change. Global climate change effects on fish species occurrence in streams were evaluated by means of a number of linked general circulation, groundwater recharge, stream temperature, and streamflow exceedance models. General circulation models (GCMs): Fish Vis Mapper results are based on a emissions scenario known as “A1B”, developed by the Intergovernmental Panel on Climate Change (for more details see: http://www.grida.no/publications/other/ipcc_tar/?src=/climate/ipcc_tar/wg1/343.htm#box91). The A1B emissions scenario assumes a balanced approach to energy production is followed (fossil versus non-fossil) for the remainder of this century. The A1B emissions scenario was used as input to 13 general circulation models that provide potential air temperature and precipitation patterns to the remaining models. Groundwater recharge model: The USGS Soil-Water-Balance (SWB) model was used to estimate changes in potential groundwater recharge in response to projected air temperature and precipitation patterns for Wisconsin. Stream temperature model: An artificial neural network model incorporating landscape factors, air temperatures, and potential groundwater recharge was calibrated to observed stream temperatures. The model was used to estimate potential for changes in stream temperature for individual stream segments. Streamflow model: Multiple linear regression models were created to relate landscape and stream network characteristics with precipitation amounts in order to provide estimates of streamflow exceedance for specific parts of the year: annual median, 90% exceedence flow for the month of August, and 10% exceedence flow for the month of April. Fish habitat model: Individual fish presence/absence models for 14 species of interest were calibrated to existing fish sample collection data. Fourteen species were selected that occur across the region and represent three thermal classes (cold, cool, and warm water streams). The fish habitat models generally include landscape, streamflow, stream temperature, and climate variables as drivers. Vulnerability of fish species to climate change was evaluated by comparing predicted species occurrence under current conditions to predicted fish species occurrence under future climate conditions for 13 climate models and 14 fish species using two measures: 1) vulnerability, opportunity, and sensitivity, and 2) probability of occurrence and change in probability of occurrence. Excess fine sediments are a problem for stream macroinvertebrates when they embed rocky substrates. Previous studies correlated macroinvertebrate traits such as burrowing vs. clinging behavior, case building, and fragile gills with fine sediments. These traits may make macroinvertebrates vulnerable to high sediment loads and would inhibit them from being dominant community members. North and south shore western Lake Superior streams have a wide range of fine sediment amounts due to clay and sand soils, but low amounts of other stressors, and thus are a good region to investigate relationships between macroinvertebrate traits and fine sediments. We created a combined sediment variable comprised of embeddedness, depth of fine sediments, and total proportion fine sediments. Macroinvertebrate traits significantly correlated with the sediment stress axis included mayfly, stonefly, and caddisfly (EPT) richness; fragile gill taxa richness; and proportion taxa with hard exoskeletons. Together, the traits create an indicator that helps determine whether or not macroinvertebrate impairment is due to excessive sediments. Interestingly, stream macroinvertebrates seem to sustain few effects on assemblage diversity as long as fine sediments are continually washed out of rocky substrates, and the substrates do not remain buried. Valerie Brady*, Lucinda Johnson, Dan Breneman*, Josh Dumke, and Robert Hell, Natural Resources Research Institute, University of Minnesota Duluth, 5013 Miller Trunk Hwy, Duluth, MN 55811. vbrady@d.umn.edu. NRRI aquatic ecologists have been sampling Duluth and North Shore stream macroinvertebrates since the late 1980’s. Although the studies, goals, and methods varied, these data provide the ability to compare present-day stream invertebrate assemblages with those of up to 25 yrs ago, investigate yearly variability, compare wet and dry years, put small studies into a larger context, and other analyses. In some cases, basic water quality and habitat data were collected in addition to the invertebrate samples. A couple of studies also took Chironomidae to genus for added taxonomic resolution. Two studies included south shore western arm streams for even more comparative capability and a greater range of stream and substrate types. PIs included Anne Hershey, Carl Richards, Lucinda Johnson, and Valerie Brady; all were ably assisted by a number of graduate students, technicians, and taxonomists. Brook trout in the North Shore region of Lake Superior are very sensitive to temperature and hydrology changes. Climate change is expected to cause increases in water temperature and possible decline of summer low flow. To estimate the effects of climate change to brook trout in this region, we developed several empirical models to predict stream temperature, and brook trout presence/absence using current (1996-2009) hydrology, air temperature and land cover. Together with projected air temperature and stream flow, these models forecasted the future (2020-2089) stream temperature and the risk of brook trout in more than 400 survey sites located in 329 streams in this region. Results indicated that averagely summer stream temperature in this region will increase by 1.2oC in 50 years. Consequently, 20% of current trout streams may lose trout, particularly in the lower shore area, where trout were predicted to disappear from almost all streams. In middle shore area, brook trout may be extirpated from half of current trout presence streams. Streams in the upper shore were less affected by climate change. Overall, suitable brook trout habitat in North Shore streams was predicted to shift northward in response to climate change. Guideline development for timber management within riparian management zones (RMZs) requires consideration of economic benefits and potential effects on water quality and riparian/stream ecosystem function. The quantity and quality of organic matter (OM) inputs and standing crops of OM within streams can affect aquatic food webs. We measured organic matter inputs and in-stream OM standing crops in eight Minnesota streams in an experimental manipulation of varied levels of riparian harvesting. RMZs were either unharvested (controls), or harvested within 45 m of the streams to low (5.7 m2/ha) or medium (11.5 m2/ha) residual basal area (RBA). Total overhead organic matter inputs to streams were lower immediately after riparian harvesting in low and medium RBA treatments. Five years post-harvest, low RBA treatments had higher overhead wood inputs to streams. In-stream standing crops of leaves, wood, and fine organic matter 5 years post-harvest were greater and more variable at medium RBA sites than low RBA sites, but no significant differences between harvested and control reaches at either harvesting level were found. Our results show riparian harvesting treatments of similar magnitude would have minimal long-term impact on OM inputs and standing crops in streams of similar geomorphic settings of the riparian areas we examined. Tom Estabrooks*, MPCA Project Manager; Nathan Mielke, Ben Lundeen, and John Sandberg, MPCA North Biological Monitoring Unit; Jesse Anderson and Stacia Grayson, MPCA Environmental Analysis & Outcomes. Abstract: MPCA’s Watershed Approach to condition monitoring and assessment is conducted on a major watershed scale with the goal of assessing all of Minnesota’s surface waters over a ten year period. Through the Watershed Approach, lakes and streams are intensively monitored to determine the overall health of the water resources, identify impaired waters, and identify those waters in need of additional protection efforts to prevent impairments. Collection of data on water quality conditions includes: biological and physical monitoring, flow and load monitoring, and chemical monitoring. Intensive watershed monitoring began in the Lake Superior South watershed in 2011. The data collected, along with other credible data is used to assess Minnesota’s surface waters to determine if they are meeting the appropriate designated uses for Aquatic Life, Aquatic Recreation, Aquatic Consumption, and Drinking Water. Results of the assessment process for Lake Superior South watershed identified nine stream segments and five beaches as not meeting the designated uses and were added to Minnesota’s Draft 2014 Impaired Waters List. Current activities within the watershed include ongoing civic engagement and a stressor identification process for biological impairments. Future activities will include watershed modeling, TMDL completion and a Watershed Protection and Restoration Strategies (WRAPS) development. Lake Nipigon is the largest inland lake in Ontario and is an important fisheries and recreational resource. Currently, two large systems that discharge into the Lake have proposed hydroelectric developments. It is well documented that increases in mercury (Hg) and methyl-mercury (MeHg) can result from the establishment of waterpower developments. The purpose of this study was to establish a baseline for total Hg and MeHg in sediment, water, fish tissue, and benthic invertebrate tissue at the mouths of tributaries and open water sites. Samples were analyzed for low-level total Hg and MeHg, general chemistry, and metals. Total Hg and MeHg concentrations in water ranged from 0.33 to 2.13 ng/L and 0.01 to 0.1 ng/L, respectively. Total Hg concentrations in sediment ranged from 3 to 58 ng/g dry weight, with MeHg accounting for an average of 0.4% of the total Hg concentration. MeHg did not correlate well to total Hg or total organic carbon content in the sediment. In the young-of-year Spottail Shiners, MeHg accounted for an average of 80% of the total Hg concentrations measured in the whole fish, and exceeded the Canadian tissue residue guideline for the protection of wildlife consumers of aquatic biota. Oligochaetes were collected for tissue analysis, and contrary to the fish tissue, only 5% of the total Hg concentration was comprised of MeHg. A food web assessment will be conducted to establish a baseline that can be used for comparison purposes in post-development monitoring. This report details the first of a two part effort to begin developing an ecological systems understanding of sediment loading and its impacts on stream health along Lake Superior’s North Shore. This initial assessment focused on characterizing the landscape of the North Shore as well as collecting and organizing available water quality data and data on aquatic organism health. This assessment also used GIS-based tools to identify reference and degraded areas along the North Shore. Aerial flyovers and field studies were also used to expand upon GIS findings and to further characterize stability and erosion hazard along North Shore streams. Initial findings show wide variability in stream turbidity levels with some of the greatest suspended sediment loads occurring in the spring of the year. IBI scores were found to have “Good”, if not “Fair”, overall health and diversity. Anthropogenic stressor results showed that potential impacts from these variables were most highly concentrated around the more urbanized areas of Duluth and Two Harbors near the Lake Superior Shore. A group of 33 sites was also field assessed for channel stability using Rosgen’s modified Pfankuch assessment; approximately ~42% of those sites were considered to have “Good” stability, ~27% “Fair”stability and ~31% “Poor” stability. Compared to trout streams in central and southern Minnesota, the trout streams along Lake Superior’s North Shore lack substantial groundwater aquifers, and are therefore particularly susceptible to both land use change and climate change. To help develop management strategies to address urbanization and climate change impacts on these streams, stream temperature models have been developed specifically for North Shore streams. As part of a temperature TMDL, a relatively detailed, network stream temperature model was developed for a highly urbanized trout stream (Miller Creek). Urban development was found to impact the temperature of Miller Creek via both stormwater inputs and reduced riparian shading. In a subsequent project focused on climate change, catchment-level deterministic and empirical models were developed to project the impacts of climate change on stream temperature in less developed North Shore trout streams. These models were calibrated based on historical climate and stream data, and then used to project future (2020-2089) stream temperature conditions based on climate data from several global climate models. Overall, stream temperatures were projected to increase 1.3 to 3.5 °C, depending on the month and climate model data used. The projected stream temperatures were used to project the future extent of brook trout habitat in the North Shore region. Since European settlement, invasive earthworms have transformed the structure, composition and function of cold-temperate hardwood forests of North America. Earthworm-invaded areas are characterized by reduced forest floor thickness, altered biogeochemical processes, increased soil compaction and leaching, and reduced soil moisture and nutrient availability. These ecosystem level changes are correlated with a cascade of changes in forest communities, however, little is known about the impacts on associated aquatic ecosystems. Hydroregime in vernal pools is expected to change as a result of earthworm invasion. Heavily earthworm-invaded areas that contain multiple species in different ecological groups are expected to experience increased inflow of water and volume following spring run-off and precipitation events resulting from increased compaction and the loss of the forest floor. However, the burrowing behavior of earthworms should result in shorter hydroperiods due to more rapid draining from increased and deeper water infiltration. Nutrient inputs into vernal pools should increase with earthworm invasion. Persistently wet riparian zones of vernal pools can support highly active earthworms which incorporate the previously thick floor into the upper mineral soil horizon. These heavily impacted soils will be associated with substantially increased transport of mineralized or highly labile forms of N, P and C.
The Red Clay Project was a research and demonstration project completed in 1980 and sponsored by five soil and water conservation districts from two states. The local district supervisors were committed to the task of seeking practical solutions to the many forms of red clay erosion and the resulting water quality problems. The overall objectives of this project were to demonstrate economically feasible methods of improving water quality, to assess the capabilities of existing institutions to cooperatively implement a pollution control program and to provide data and recommendations that could be used in future programs. This poster is a review of the recommendations that came out as a result of this extensive research and management project. Lake Superior is a lake of extraordinary biodiversity. It contains endemic fishes, a unique deepwater form of Lake Trout, and the cool coastlines and islands harbor arctic-alpine plants and Woodland Caribou. It is also a region of growing threats. In the fall of 2012, the Superior Work Group of the Lake Superior Lakewide Action and Management Plan (LAMP) initiated a biodiversity conservation assessment for Lake Superior. This project supports implementation of the Great Lakes Water Quality Agreement (GLWQA), and contributes to the GLWQA Annex 7 commitment to “complete the development and begin implementation of lakewide habitat and species protection and restoration conservation strategies…” This Biodiversity Conservation Assessment will provide the scientific basis for a biodiversity conservation strategy that will be initiated later this year. The final Lake Superior Biodiversity Conservation Strategy will be similar to projects that have been completed for the other four Great Lakes. Changing climate conditions will impact efforts to protect and restore Lake Superior. Current observations in the Lake Superior basin demonstrate that some changes in climate are already occurring, including increases in surface water and air temperatures and a decrease in the extent and duration of ice cover. Projected climate changes could have a range of future potential effects on Lake Superior ecosystems, including a decrease in the abundance of cold water fish and changes to coastal wetlands. In this report on Lake Superior Climate Change Impacts and Adaptation (referred to as the Report), the available science and identified adaptation opportunities for Lake Superior ecosystems has been synthesized. The Stewart River Watershed is a small but important slice of the Lake Superior basin. The drainage is a combination of landscapes and ownerships, from maple highlands and aspen forests and openings to spruce muskegs and a mix of conifer cover in both public and private management. Swaths of public county tax-forfeit forestry lands cover the northern half of the drainage while parcels of private lands primarily dot the downstream landscape. The watershed has been reshaped numerous times since the heyday of white pine logging, a century of settlement and the more recent removal of large areas of forest cover. Since 1900 the forest type has shifted from primarily conifer species to deciduous species with the overall age of the forest growing much younger and able to provide less cover and vegetative matter for the stream. The result is that stream flows fluctuate wildly and the entire hydrologic holding capacity of the watershed has been reduced. Water simply runs off the landscape faster today than ever before. The Stewart River Enhancement and Watershed Improvement Project of Trout Unlimited aims to focus on several in-stream restoration projects that can directly enhance fish habitat as well as involve private landowners and their property in conservation practices across the landscape. Grants made possible through the Legislative Commission on Minnesota Resources (LCMR) have allowed Trout Unlimited to focus on improving the overall health of the Stewart River watershed. Jason Naber, Emmons & Olivier Resources, Inc. The Stressor Identification process is part of the larger Watershed Restoration and Protection Strategies for the Nemadji River watershed. The process identifies potential biotic stressors and develops the preliminary information necessary to complete TMDL reports for water bodies listed as “Impaired” or not meeting designated water quality standards. Each potential stressor is evaluated thoroughly. Although a significant volume of research and monitoring data are available for this watershed, and likely stressors are known by professionals familiar with the watershed, a robust Stressor ID process is being initiated with the broadest range of candidate stressors developed from similar aquatic systems with aquatic life impairments. Abstract: The lower reach of the Poplar River is impaired due to excess sediment entering the stream. A TMDL report has been completed, along with extensive field reviews of watershed land use and water erosion prediction modeling to understand and quantify the sources of sediment to the river. Concurrent with the TMDL investigative work, local landowners have made a consistent effort to select and construct the most effective BMPs to manage sediment in the watershed. A recent review of water quality data shows sediment declining by 35% from the earlier annual average loads prior to BMP work. Additional projects to further reduce run-off and erosion are under development. The U. S. Geological Survey, Natural Resources Research Institute, and Minnesota Department of Natural Resources are conducting a three-year study to: 1) assess copper, nickel, and other metal concentrations in surface water, rocks, streambed-sediments, and soils (including parent material) in watersheds that cross the mineralized basal contact of the Duluth Complex; and 2) determine if these natural concentrations are currently influencing regional water quality in areas of potential base-metal mining. Water-quality, streambed-sediment, soil, and bedrock samples will be collected and analyzed in three unmined watersheds with the following different mineral-deposit settings: (1) copper-nickel-cobalt-platinum group metal mineralization (Filson Creek watershed), (2) titanium-oxide mineralization (headwaters of the St. Louis River watershed), and (3) no identified mineralized deposits (Keeley Creek watershed). Water samples will be analyzed for 12 trace metals (total and dissolved concentrations), 14 inorganic constituents (dissolved concentrations), alkalinity, and total and dissolved organic carbon. Soil, streambed-sediment, and bedrock samples will be analyzed for 44 major and trace elements, total and inorganic carbon, and 10 loosely bound metals. Continuous streamflow and water-quality data will be applied to new hydrologic models and existing biotic ligand models to assess the influence of existing geochemistry and possible mining activities on regional water quality. Over the last decade, bank erosion and lateral migration along Grand Portage Creek have threatened important cultural resources and historical landmarks, especially near its mouth at Lake Superior. The purpose of this study is to identify stream reaches throughout the watershed that are migrating, eroding, or depositing sediment at rates above pre-EuroAmerican settlement or prior to the 1700s. The study is being conducted by a partnership of the National Park Service, U.S. Geological Survey, Grand Portage Band and Geological Society of America. The watershed-based study uses a combination of field-based channel and floodplain geomorphic assessments, historical records, Geographic Information System analyses, and alluvial stratigraphy. A rapid geomorphic assessment of the creek from its mouth to headwaters was completed in 2012-13 along 67 reaches and includes measurements of channel morphology, streambed sediment, bank erosion, valley type, and geologic setting. Permanent channel cross sections, longitudinal profiles, and floodplain soil cores were established at a subset of 15 reaches and measurements will continue into 2014. Data analyses has just began, but preliminary results show the importance of glacial geomorphic setting and bedrock structure in regulating the Creek’s responses to land cover and climate change. The Knife River was listed as impaired with a total maximum daily load (TMDL) for turbidity in 2010. Much of the sediment leading to this impairment enters the river from unstable streambanks. The Lake County Soil and Water Conservation District (SWCD) is working to reduce the sediment load by designing and implementing streambank stabilization projects. Streambank stabilization projects use natural design methods established by hydrologist Dave Rosgen. This method, known as toe-wood, uses tree trunks, root wads, and brush to create a stable streambank. A stable streambank is more able to withstand erosion, resulting in less sediment entering the Knife River. A toe-wood project constructed in 2011 by the SWCD withstood the June 2012 flood. More projects of this type are in design to be constructed on the Knife River. In 2011, the Minnesota Pollution Control Agency (MPCA) undertook the intensive watershed monitoring effort of both the Lake Superior South and the Nemadji River Watersheds. A total of 77 biological monitoring stations were established at the outlets of varying sized sub-watersheds. As part of this effort, MPCA staff joined with local government units and organizations to complete stream water chemistry sampling at the outlets of eight subwatersheds. In 2013, a holistic approach was taken to assess all of the watershed’s surface waterbodies for support of aquatic life, recreation, and consumption. Seventy-one stream segments and 14 lakes were assessed in this effort. Not all lake and stream segments were assessed due to insufficient data, modified channel condition and/or their status as “limited resources waters”. Data collected between 2001 and 2011 suggest aquatic life impairments on 20 stream segments, aquatic recreation impairments on five streams segments and two lakes, and aquatic consumption impairments on two stream segments. Impairments found in both watersheds include biological (fish & macroinvertebrate), turbidity, dissolved oxygen, pH, bacteria, and mercury in fish. Terrestrial laser scanning (TLS) technology provides high-resolution topographic data that can be used to detect geomorphic change in fluvial environments. In this study, we utilize successive terrestrial laser scans to investigate the relationship between peak flow rates and stream bluff erosion in the Amity Creek watershed in Duluth, Minnesota. Eight sites were selected for TLS analysis; scans were conducted following all large rain events, spring melt, and during times of low base flow. Using our change detection measurements, we calculated an annual average retreat rate of -0.50 m/yr. By applying this rate to a watershed-scale bluff inventory, we estimated the total volume of sediment eroded from unvegetated bluffs in the watershed between November 2011 and November 2012. Results show that bluffs are likely the primary source of fine sediment contributing to the creek’s turbidity impairment. Load calculations from our bluff erosion work were compared to MPCA estimates from previous years, and were found to conceivably represent 100% of the total sediment load even with the 500-year event removed. June flood loads were determined to account for approximately 80% of the sediment load from bluff erosion between November 2011 and November 2012. TLS results from this study prove that major events are responsible for inducing considerable bluff erosion and moving the vast majority of sediment through the system. Additionally, our data demonstrate that management of turbidity-plagued watersheds along the North Shore and other regions of the state must include a focus on bluffs. A study was conducted beginning in 2007 to estimate the magnitude of sediment sources along the Knife River, a tributary to Lake Superior. The study involved conducting geomorphic assessments of the main channel of the river, characterization of the bluffs lying adjacent to the river, outlining of tributary watersheds to the river, and modeling of surface runoff, overland flow erosion, channel erosion, and streambank erosion. The modeling involved the use of the SEDIMOT model for tributary hydrology and overland flow erosion, and the CONCEPTS model for simulating the erosion of the channel and streambanks. Cross-section data for about 25 locations along the river were available, and these were augmented with section data generated using a well-tested synthetic method. Precipitation data for three storm events was used with the hydrologic model to simulate surface runoff and overland flow erosion. The sediment generated from the various sources, overland flow in tributary watersheds, overland flow from bluffs, and streambank erosion was compared to the measured sediment loads at the gaging station at the mouth of the Knife. Comparison between simulated loads and measured loads was considered fairly good. The fraction of sediment generated from the three sources were: 59% from streambanks, 29% from bluffs, and 12% from upland areas. The Duluth, MN, area experienced massive flash flooding following 8-10 inches of rain in 24 hours in June 2012, causing extensive damage at Jay Cooke State Park. One affected site involved a levee breach on Forbay Lake, releasing a flood wave downslope, carving a deep valley and destroying part of Highway 210. Although devastating for the park, the event provided opportunities for student research and outreach. Students from two classes at the University of Minnesota Duluth (UMD) conducted research in October 2012 to reconstruct magnitude and timing of the flood wave, impoundment behind the road, breaching of the road, and subsequent incision. Student projects focused on delineating the flood wave’s lateral extent; determining peak shear stress and its effect on sediment mobility; estimating volumes of material eroded from the levee and deposited in the temporary impoundment; and tracking knickpoint propagation. Graduate students in a fluvial geomorphology course were able to address more complex issues including paleoflood discharge, levee geotechnical stability, and detailed long profile development. Collectively, they were able to extensively document what happened during the flood event at this site. To explain this dramatic event to park visitors, science education students from the University of Wisconsin Superior are taking data collected by UMD students and developing education materials. This collaboration between UMD, UWS, and the Minnesota Department of Natural Resources has provided research and public outreach opportunities for students that will eventually help educate the general public. The Minnesota Pollution Control Agency’s (MPCA) North Biological Monitoring Unit works actively in the Lake Superior Basin on projects related to the monitoring, assessment, restoration, and protection of rivers and streams. Biomonitoring is an important component of the Intensive Watershed Monitoring (IWM) approach; since 2009, IWM biomonitoring, assessment, and reporting has been completed (or is near completion) in three of Minnesota’s five Lake Superior Basin major watersheds. The Lake Superior North watershed will enter its second year of monitoring in 2014, and work is scheduled to begin in the Cloquet River watershed in 2015. A parallel project was recently initiated to more frequently monitor a network of least-impacted “reference sites” across the state; many of these sites lie within the Lake Superior Basin. These long-term monitoring sites represent a variety of stream types (e.g., headwater streams, large rivers, coldwater streams, low gradient streams) in their most natural condition, and will be monitored on a biennial schedule. This poster may also briefly cover other aspects of MPCA’s biomonitoring program in the Lake Superior Basin, including: the development of Tiered Aquatic Life Uses, biota-based diagnostic tools to aid stressor identification, and a database tool for rapidly summarizing temperature logger data in terms of species-specific growth/stress/lethal durations. 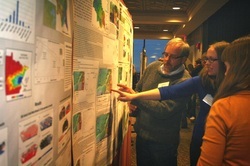 Abstract: The Northland NEMO (Nonpoint Education for Municipal Officials) program’s Watershed Game is an interactive tool with a record of success in helping local government officials and others understand the connection between land use and water quality. Participants learn how a variety of land uses impact water and natural resources, increase their knowledge of best management practices (BMPs), and learn how their choices can prevent adverse impacts. Participants apply plans, practices, and policies that help them achieve a water quality goal for a stream, lake, or river. It has been used throughout Minnesota and in other areas of the country to build the knowledge base of local leaders, providing sound science and easier understanding of TMDL's and their role in achieving them. Currently, nearly 100 facilitators in 9 states have been trained to use the activity. Abstract: Through surveys, focus groups, and interviews, Minnesota Sea Grant recognized that communities were interested in adapting to climate change, but didn’t know where to start or how to begin thinking about climate adaptation. To address this need, we worked with the Great Lakes Sea Grant Network to develop a checklist designed to start the conversation. Titled “A Self-Assessment to Address Climate Change Readiness in Your Community,” it covers a range of categories including: critical infrastructure and facilities, infrastructure, operations & maintenance, water resources, ecosystems & habitats, tourism & recreation, and community planning. During an initial meeting with community staff and officials, we present introductory information on climate change and adaptation, describe the self-assessment, and come up with a process for participants to return the assessments to us. We then analyze the responses and schedule follow up meetings to discuss the results and help the community determine their next steps. Taylor, D. L., Hill, B. H., and Pearson, M.S. concentration during snowmelt, baseflow, and precipitation events were taken in these reaches during 1997- 1999. In-stream and riparian habitat quality were also assessed, as was land use and land cover in each stream’s watershed. The stability of each stream reach was re-evaluated in 2010-2012 and geomorphic assessments were repeated. Streams were considered unstable if the Rosgen geomorphic stream type had changed or if the width:depth ratio had more than doubled. The effects of stability on SS outputs were analyzed via linear regression. Logistic regression was used to determine stability over the course of the study. Stability after 12 to 14 years was best predicted by stream geomorphology, suspended sediment and bedload outputs, and the presence of wood in the riparian zone and streambed. Suspended sediment outputs could be predicted by stability over 12 to 14 years, geomorphology, discharge, wood availability, and by agricultural and road densities within the streams’ watersheds. Moose are commonly seen feeding in aquatic environments, but moose spatial and temporal relationships with aquatic environments across longer time periods is difficult to quantify. One reason for this is that moose are easy to observe in the water. We radiocollared moose and collected location data over a three year period and determined time moose spent in or near water over an entire season. Use of aquatic environments by moose occurs from late May through early August. We analyzed locations of moose in water, wetland cover types, and adjacent to water and wetland cover types. For most moose there was an increase in use of wetland cover types in the summer when temperatures were warm. From 30 to 70% of locations were in and near wetland cover types on hot summer days. In some cases moose were still not selecting for wetland cover types at the landscape scale because 40 to 50% of the home range was of the wetland cover types. Moose also consume aquatic macrophytes to supplement sodium in their diets. We are using activity loggers on collars in association with cover type identifications and aerial photographs to identify what proportion of active time moose are feeding on aquatic macrophytes. Brook trout are the only stream dwelling trout native to the upper Midwest and populations have declined dramatically since early settlement; however, the extent, severity, and in some cases, the specific cause of the decline is unknown. Current fishery data along with landscape scale GIS data is being used to model the status and distribution of brook trout at the catchment and subwatershed scales in an effort to complete a range-wide status and distribution map throughout their native range in the United States. Partner agencies have provided recent fisheries data collected throughout the U.S. portion of the Lake Superior basin, and additional data has been collected during the 2011-2013 field seasons. Catchments and subwatersheds with sufficient data have been classified according to brook trout population status. Landscape scale metrics are being used to develop a classification tree model to predict brook trout status in areas where fishery data is insufficient. The end product, geo-referenced maps and data will assist biologists, land managers, and other interested parties evaluate and prioritize areas for protection, enhancement, or restoration of brook trout populations and provide a baseline for monitoring climate change effects on cold-water species. The Great Lakes Basin Fish Habitat Partnership is committed to supporting healthy fisheries by funding and coordinating efforts to improve and protect fish habitat. We utilize a strategic, science-based approach to address the root cause of habitat decline on a landscape scale. The proposed poster will describe the Minnesota portion of our habitat assessment modeling that was completed on all US streams that drain to the Great Lakes. The models, analyses, and data produced in tributary habitat assessments first describe fish distribution as a result of land use and habitat conditions. The statistical modeling that predicts fish distribution is then used to generate indices of anthropogenic stress and natural habitat quality. These indices can be used to set restoration and protection priorities with a broad scale perspective. These models can help managers, agencies and local groups identify what kinds of restoration projects will improve fish distribution and target where those projects will be most effective in benefiting aquatic species. Model results and associated decision support tools can be used by partners all throughout the region to focus limited resources in areas where restoration will most make a difference. Many streams on the North Shore of Lake Superior are impaired for turbidity. High-resolution LiDAR-derived DEMs offer a unique opportunity to develop a GIS model for identifying erosional hotspots in these streams, which can be used to inform watershed management decisions to reduce sediment loading. We used 3-m LiDAR-derived DEMs to identify several erosion predictors along Amity Creek. Because bedrock exposure significantly limits erodibility, we investigated bedrock exposure using Minnesota Geological Survey bedrock outcrop maps and by mapping bedrock exposure using a feature extraction tool. Predictions based on remote data were compared with a field dataset that recorded erosion after a 500-year flood event. The most significant variables are bedrock exposure, a stream power-based erosion index, and bluff proximity. A threshold-based conceptual model including the three successful predictors was 70% accurate for predicting erosion hotspots. The limited predictive power of the model stemmed in part from differences in locations of erosion hotspots in a single large-scale flood event vs. long-term erosion hotspots. The inability to predict site-specific characteristics like large woody debris or vegetation patterns makes predicting erosion hotspots in a specific event very difficult. In addition, this model requires high-resolution bedrock exposure data, which may limit widespread application. This Symposium is funded in part by the Coastal Zone Management Act of 1972, as amended, by the NOAA’s Office of Ocean and Coastal Resources Management, in conjunction with Minnesota’s Lake Superior Coastal Program.